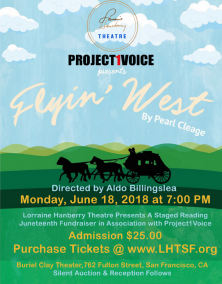 SAN FRANCISCO - June 12, 2018 - PRLog -- Lorraine Hansberry Theatre (LHT) presents a benefit staged reading of FLYIN' WEST by Pearl Cleage in association with Project1VOICE (P1V) in the Buriel Clay Theater at 762 Fulton Street in San Francisco on Monday, June 18, 2018 at 7:00 PM. Now in its 8th year, P1V's One Day One Play signature event held in the midst of Juneteenth celebrations revives and reintroduces classic plays from the African American theater canon. Staged readings of FLYIN' WEST will be presented at over 45 African American theater companies, museums and artistic organizations nationwide and abroad as part of a salute to Black theater. Fiction based on fact, FLYIN' WEST is a warm, humor filled family saga, that illuminates the rich history of black homesteaders and explores the unique and difficult challenges they faced. Set in 1898 in the historic, all black town of Nicodemus, Kansas, FLYIN' WEST is the inspiring and powerful story of four courageous African American women pioneers who take advantage of The Homestead Act and travel West to build new lives for themselves and their families against tremendous odds. Following its 1992 premiere in Atlanta at the Alliance Theatre, FLYIN' WEST was the most produced new play in the country in 1994. Aldo Billingslea, Lorraine Hansberry Theatre's Interim Artistic Director, will direct the Bay Area's staged reading of FLYIN' WEST. All local proceeds and donations will benefit the Lorraine Hansberry Theatre, a 501(c)(3) non-profit organization, and help support its 2018-2019 season. Tickets are $25.00 and available for purchase online at www.LHTSF.org. A reception and silent auction follow the reading. Founded in 1877, Nicodemus is the only remaining Western town established by African Americans during the Reconstruction Period following the Civil War. At its peak, the town boasted a population of close to 800. More than a half-dozen black settlements sprung up in Kansas after the Civil War, but Nicodemus was the only one to survive. Nicodemus was designated as a National Historical site on November 12, 1996. Founded in San Francisco in 1981, the core mission of the Lorraine Hansberry Theatre (LHT) is to present plays by both emerging and established African American and multicultural playwrights and to provide employment and career building opportunities for actors, directors, designers and technicians of color. LHT is located at 762 Fulton Street, Suite 204, San Francisco, CA 94102. www.LHTSF.org. Box Office: (415) 474-8800. Pearl Cleage is an author and playwright whose fiction and non-fiction works have been widely recognized. Her novel, What Looks Like Crazy on an Ordinary Day, was a 1998 Oprah Book Club selection. Ms. Cleage is the Playwright-in-Residence at the Alliance Theater in Atlanta. Among her critically acclaimed plays are: Flyin' West, Blues for an Alabama Sky, We Speak Your Names: A Celebration and What I Learned in Paris. For more information visit: www.pearlcleage.net. A nonprofit performing arts service organization based in New York City, the mission of Project1VOICE is to promote and support black theater and black playwrights. FLYIN' WEST is presented with special permission granted by Dramatists Play Service, Inc. www.project1voice.org.